Increased risk of cardiovascular disease in parents of polycystic ovary syndrome as evidenced by increased carotid intima media thickness and low brachial artery flow-mediated dilatation as compared with matched controls. 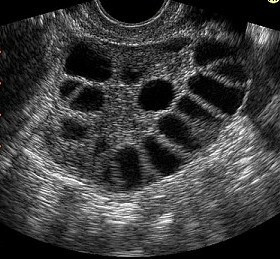 In vitro maturation (IVM) of oocytes followed by a “freeze-all” embryo strategy results in promising clinical outcomes in patients with polycystic ovary syndrome and circumvents the potential problem of suboptimal endometrial quality in IVM cycles. Increased transforming growth factor-b1 and decreased levels of its receptor, soluble endoglin are found in women with polycystic ovarian syndrome (PCOS) and may be implicated in PCOS pathogenesis and its increased risk for ovarian hyperstimulation. Potential implications of alterations of the Kiss1 system in the pathophysiology of polycystic ovary syndrome are discussed. The limited experimental and clinical evidence supporting such a role is summarized.